The colourful chairs placed to celebrate Canada's 150 birthday, have been a wonderful success in drawing in the new diverse community that is flourishing in Oakville. 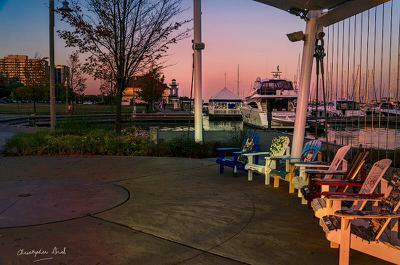 The setting sun provides exceptional,lighting for some of the chairs placed under the tensile structure .. And with the Compass Lighthoue in the background? Viola!